Is this not the smartest thing ever? 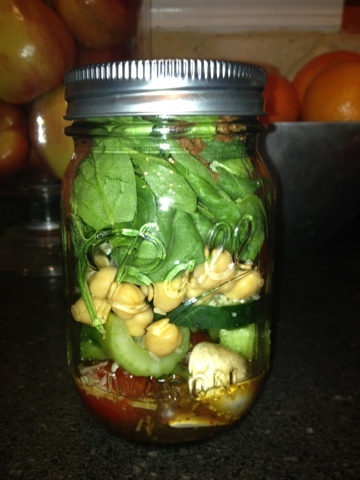 I saw the idea of the "Salad in a Jar" the other night on my favorite obsession, Pinterest the other night. Immediately I thought, Why didn't I think of that?!? I made a few of these and they turned out amazing! As long as you keep the Spinach (or whatever green you use) away from the dressing, it will stay fresh! So... be sure to add your dressing first and your greens last! I understand it will stay fresh for almost a week... I will be testing that this week. This is such a time saver for me, and will force me to eat better for lunches at work. And it's a great excuse for more Mason Jars! Hope you have a great week, friends. Talk soon!